Prime Minister Narendra Modi is holding a 'pariksha pe charcha' with students to help them relieve them from the stress of exams. Prime Minister Narendra Modi is holding a 'pariksha pe charcha' with students to help them relieve them from the stress of exams. Lakhs of students and thousands of schools across the country are connected to the event to discuss exam-related issues through a video conference from Delhi's Talkatora Stadium. PM Modi: I would request parents not to make the achievements of their child a matter of social prestige. Every child is blessed with unique talents. 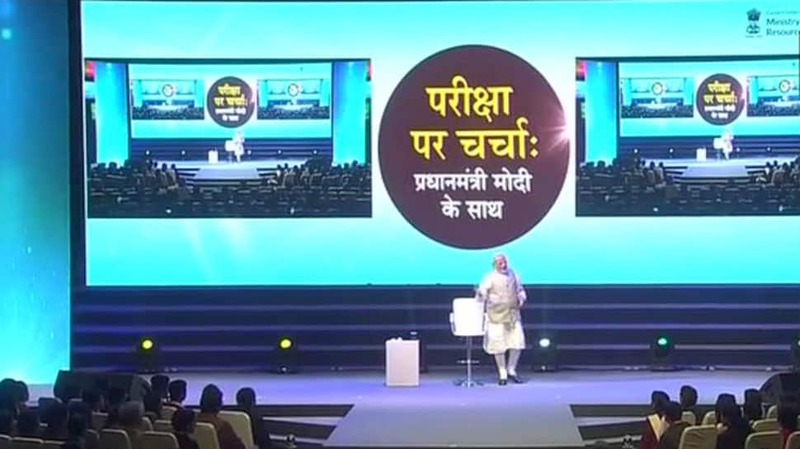 PM Modi: Parents should also not pay undue attention to the marks and support the students. Efforts should be made to reduce the stress at home. PM Modi: Always remember what every parent sacrifices for the well-being of the child. PM Modi: You do not need to bother about how many hours your friends study. You should think of how many hours you need to study in a one day, and then try to better it the next day. PM Modi: Sometimes parents force their wishes on their kids. They want their kids to become what they could not do in their life. You should have a dialogue with your parents. PM Modi: It is the dream of your parents to see the kids grow and do better. You should know that whatever they are saying is for your benefit. Several students complained of how parents put undue pressure on them to perform better. PM Modi: Concentration isn’t something that has to be specifically learnt. Every person concentrates on something or the other during the day, it may be while reading, hearing a song, talking to a friend. Students ask questions to the PM on the importance of concentration during exams, and in life. PM Modi: Winter Olympics are going on in South Korea. In the games, there is a snowboarder Mark McMorris who won a bronze medal, just 11 months after he suffered multiple injuries in an accident. You need to take inspiration and have self confidence. PM Modi: I am here as a student today, let us see how many marks will you give me out of 10. PM Modi: I used to follow Swami Vivekananda in my student days. His teachings say that 33 crore gods and goddesses can also not do anything if you are confident of what you are doing. PM Modi: How many of you think you are not confident while giving the exams? There is no shortage of the effort that students put in but if you are not confident you are unable to remember what needs to be written in the exam. PM Modi: I would like to thank mostly the children for taking part in the Clean India campaign. I'm speaking to you as a friend, not a Prime Minister today, PM Modi begins his address for the students. PM Modi welcomed at the event. Dance performances begin at the event. Songs like 'Jai ho', 'Vande Mataram' and 'Chakde India' being played. Addressing the students, HRD Minister Prakash Javadekar said we need outcome-based results for good education. "Aim of PM's educational policy is brain-gain," Javadekar said. Union Minister Prakash Javadekar begins the event by addressing students gathered at the stadium. Lakhs of students will be connected with the Prime Minister when he addresses the students from the Talkatora stadium today. PM Modi reaches Talkatora stadium to address students.